WHEN IS THE BEST TIME TO COME FISHING? Everyone buys a fishing trip with the idea they are going to “SMASH” them while on their fishing adventure. All hoping their arms are sore from fighting fish, hands and fingers are sore from hooks and tying leaders and shins are sore from continually bashing them on gaff that is sticking out of the gunnel. Oh the joys of fishing! I personally have fished for salmon since I was two years old. From the days of Grandpa raking herring and dumping them in the boat for his 2 year old Grandson to try and grab for the bait tank. To the days of jigging herring, to fish from my 10 foot dinghy with my 2.5hp “Big Block” Mercury. Now to my spoiled life at QCL and the dock staff preparing my boat for fishing daily. Although the adventures of fishing with Grandpa and in my dinghy were great, the QCL experience is second to none! Rob, quit with the soliloquy and answer the question! When is the best time to go fishing? In all honestly, with every cheeky answer there is a truth. Each river that holds Chinook or King salmon, from Alaska to San Francisco has a prime time of stock return, or when the majority of the species return to the river. That timing varies from late March to late October with the bulk of the returns happening late April through October. The return for Coho or Silvers varies but the bulk of these fish return mid-June through late October. QCL has roughly 100 days of fishing during a season. From year to year we have 12 to 15 of the greatest days of fishing one could hope for. We also have 12 to 15 poor days of fishing when everyone second guesses themselves! The issue is, I cannot tell you when either of these days are going to happen but what I can tell you is they will happen. The rest of the 70 days are productive and success is varied. Calling them average would make Grandpa turn over in his grave, he would have died for an “average” QCL day down on the south coast! 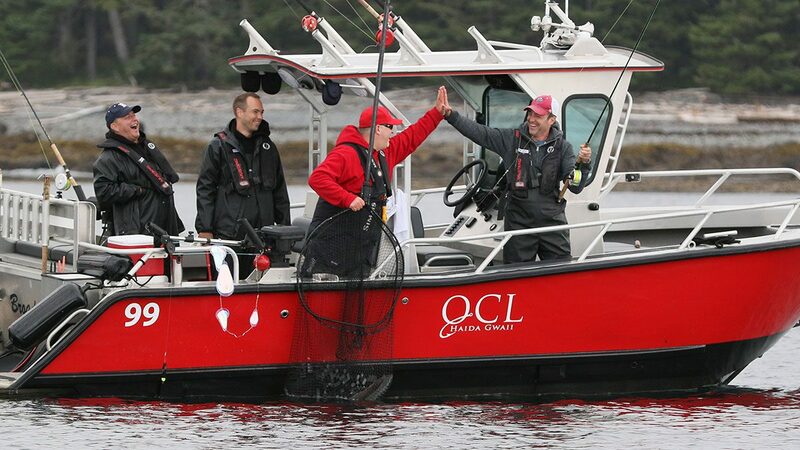 Choose QCL – If the fish aren’t biting, the service and people are amazing! They have 135 staff to deal with your every need. Call QCL and ask what dates are available. Remember, any date could have 1 of “those” days, good or bad! Continue to book the same date or close to the same date, year after year, you will run into one of “those” days eventually. When our family purchased the Lodge in the year 2000, my best buddies Bryan and Jason Killins were on the first trip of the season, May 29th to June 1st. They continued on this trip for many years with varying success. Some years’ crazy amounts of fish, some years, lots of empties in the boat. On June 2nd, 2015 we got our regular early start, off the dock at the crack of 10am! Being last off the dock has its advantages…um NO! But this day did, we were approaching “The Maz” and we saw a massive bait ball with birds feeding on the surface. We stopped to give it a “try” and 6 hours later, we had landed 76 Chinook with 14 double headers! The greatest day of my fishing career! One of the most memorable days for the lodge came in late August 2011, August 20th to be exact. When our guest Mr. Chris Lewis caught and released an 84 pound Chinook with guide Derek “Demo” Poitras. Chris has continued to fish this timeframe over the years and as luck would have it, they were graced with another monster of 49 pounds with his son Josh! Any day can be your day, it can be on your first trip or your 30th trip, but if you don’t book, you will never know! Hope to see you at the lodge this summer. All the best and Happy New Year. rob you gave yourself both titles………. nextFor a totally unique fishing adventure... try the MV Driftwood!